What are they doing – sun soaked selfies….? Question: What do people want/desire the most if they happen to be lying on a lovely sunny beach? A refreshing cool drink (of your choice) – you need to stay hydrated? A good book to read – that’s what relaxing on the beach is all about? Sun tan cream (with a high SPF factor)? A suitable companion to apply the sun tan cream? WiFi – to keep in touch with people stuck back at home in the rain, and send them sun soaked selfies? 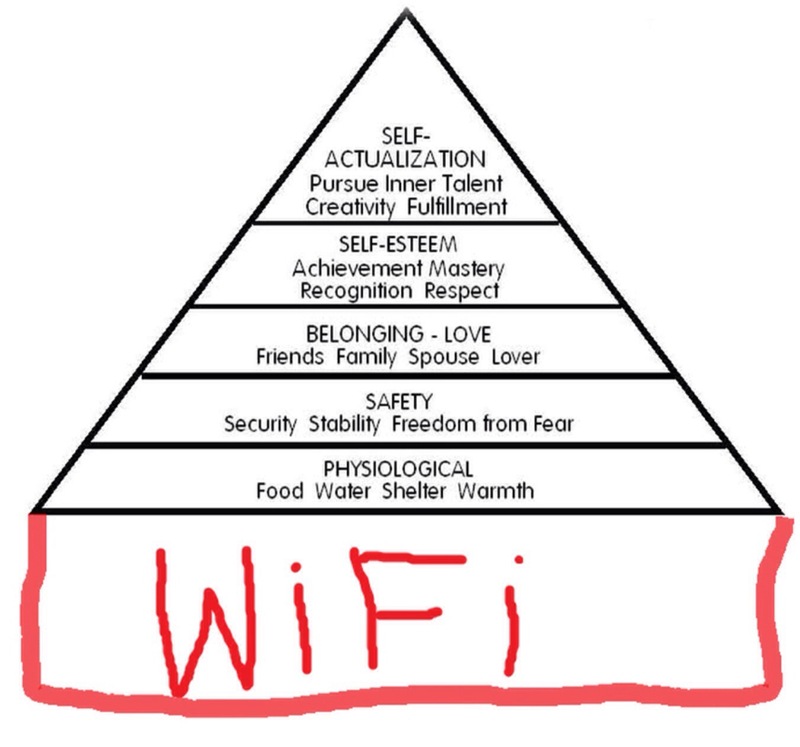 Maslow’s Hierarchy of Needs and WiFi. You’ll probably be aware of Maslow’s Hierarchy, and have seen the attached graphic illustrating how it has been updated for the internet generation. Basically, the Hierarchy of Needs is a theory about human motivation that psychologist Abraham Maslow published in 1943. The idea is that humans have 5 sets of needs that come in a particular order. This is often represented as a triangle to illustrate that needs lower down the triangle have to be satisfied before you move upwards. The theory is frequently used in business as a way of understanding staff motivation. So much so that this BBC article says, “….on management training courses it’s as inevitable as biscuits and role-playing”. From my own experiences I’m inclined to believe that WiFi has assumed the status of a basic ‘need’ for many people. If you know any teenage kids you’ll understand exactly what I mean. I did write a post about it following my experiences of hillwalking in the Brecon Beacons, in the pouring rain, not quite a sunny beach but the same principles apply. How do you exploit Maslow’s Hierarchy for Public Health? 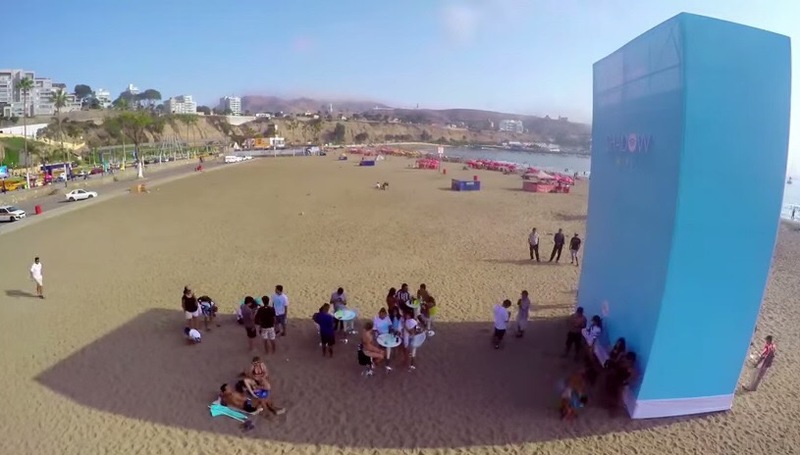 Getting back to the sunny beach, and main point of this post, I think this is a really clever idea…… Shadow WiFi in Peru. In 2015 the Peruvian League Against Cancer, worked with an organisation called Happiness Brussels to raise awareness of the risks of getting skin cancer by spending too much time in direct sunlight. Organisations worldwide have been doing this for a number of years, using a variety of awareness raising methods to coax people into changing their behaviour. What was clever about the activities in Peru was that they actually got people to change their behaviour by altering the physical environment. They tapped into one of or most basic human needs – the need for free WiFi – and they provided it, but with conditions. It would have been fairly straight-forward to provide free WiFi. You click a link and get to read some safety advice about exposure to the sun and the risk of skin cancer in the ‘sign up’. We’ve probably all experienced this sort of ‘hassle’ before you get free WiFi – it’s usually providing an email address to bombard you with advertising spam at a later date. However, they went one step further in Peru, and provided free WiFi that only worked in the shade. To do this they constructed a screen that provided the shade and placed the WiFi transmitter at the top. The transmitter had a device that tracked the sun and only provided WiFi within the area of shadow. In direct sunlight, no free WiFi, brilliant! The Happiness Brussels video below gives a good explanation if what they did, or you can read about it in this psfk.com article. What does behaviour change cost? I’m struggling to find any details of how much the Shadow WiFi in Peru cost. However, based upon the little bit I know about scaffolding (to hold the sun shade) and WiFi technology, I’m guessing it’s in the thousands of pounds rather than tens or thousands of pounds. Measuring current and future cost of skin cancer in England, Journal of Public Health (2013); states that skin cancer will cost NHS England £180 million a year by 2020. From Australia, Lifetime cost-effectiveness of skin cancer prevention through promotion of daily sunscreen use (2012) via the International Society for Pharmacoeconomics and Outcomes Research (ISPOR). This suggests that a cost of approximately AUS $50,000 for the use of sun screen prevents future costs associated with skin cancer of over AUS $800,000. 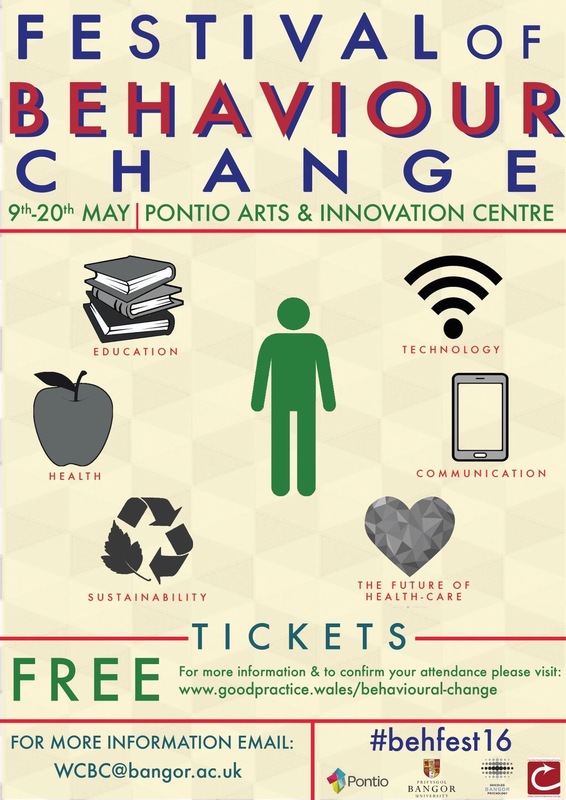 If you are really interested in this sort of thing…… You should come a long to the Festival of Behaviour Change at Bangor University between the 9th -20th May, #BehFest16. You can see the programme and book via this link on www.goodpractice.wales/bangor. 19th May is a specific day where we will be focussing on the use of technology to promote behaviour change. Some People can become so used to having something (like WiFi) that it can appear to be a ‘basic human need’, on which they depend. If you are that dependant upon something, there are opportunities to use that dependency to influence other behaviours. Using technology (or other methods) to influence behaviour can have a positive effect on People and prevent significant costs in the future. Prevention is always better than cure. I do love this example, a fascinating way of changing behaviour. Loved this talk shared by @JoPyrah on Twitter on changing behaviour WITH people – a really interesting talk that meshes co-production and behaviour change (https://www.youtube.com/watch?v=BVbHlZ7Ikt4&feature=youtu.be).